Stained glass windows are worth something, aren’t they? But how is their value determined? Some people think you can’t even put a value on certain windows because they’re “simply priceless,” but that’s not true. Every stained glass window in the world could conceivably be appraised and given an assessed value. Indeed, most are, for insurance purposes. 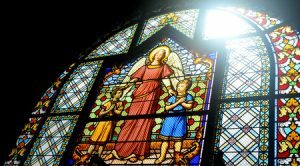 Basically, the value of stained glass windows depends on the glass, as appraised by a professional expert who knows all about stained glass. 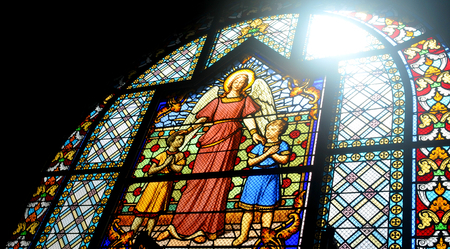 What are some things that matter when determining how much stained glass windows are worth? For starters, are the pieces of stained glass cut from a sheet of colored glass and leaded into a window, or are the pieces painted/fired with shadings or stencil designs? How about the lines? Are there varied lines involved in the window design or just straight lines used? How many layers are used? The more layers used, the more the glass is worth. Is there a design in/on the glass or not? Those with designs are worth more than plain ones. The more detail, the more something’s worth! Other factors that go into determining the value of stained glass windows include their age (older ones are worth more than newer ones, generally), glass sizes (the smaller the pieces used, the higher the value since smaller pieces require more glass cutting and lead), and what the glass might contain– figures, medallions and symbols can add value to pieces. The more historic and beloved a particular window is, the more it’s generally worth. Getting even more particular, one might include factors like “how much would it cost to replace this stained glass today?,” followed by where did the work originate, who was the artist, what’s the current condition of the window, and is there a protective coating on it or no– all valid questions. As you can see, a lot goes into determining the value of stained glass windows. Cumberland Stained Glass of Mechanicsburg, PA, can help you determine the worth of your stained glass windows, as well as repair/restore them as needed. Please call 717-691-8290 with your questions and concerns, or email us at [email protected].